I was contacted by Richard Bean, a local journalist from the Wigan Observer. He had bought his mum some of our chocolate for her birthday (from one of our stockists in Standish, Bumbles) and contacted me to see if he could write about Luisco Chocolate. 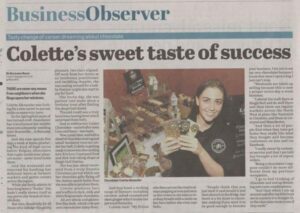 I was honoured to do my first newspaper article and loved sharing details of my business with Richard, I’m very proud of how far I have come in a short space of time, especially with two toddlers in tow! Thank you for the feature Richard! I hope you all enjoy reading the article.